Apple’s iPhone has caused a revolution of the mobile age. The multi-touch screen evolved from the technology of tomorrow to the product of today. While the iPhone isn’t exactly a power hogging device, its battery life is pretty mediocre. Not horrible, but not too impressive either. If you happen to be one of the millions of iPhone owners who have been caught in a jam, out and about with no battery life left on your Apple device to speak of, than this iPhone Battery Case might seem mighty inviting to your mobile addicted eyes. This isn’t your average iPhone case, as you might have already guessed. This case comes included with a built-in high capacity li-ion rechargeable battery. The sheepskin case keeps the edges of your phone protected from wear and tear, while the battery provides you with a charge of juice when your battery is running low. And it’s even pretty affordable. 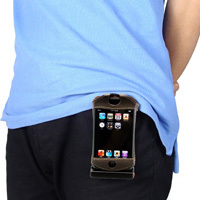 For only around $25, you can save yourself from being left without your precious iPhone. But now you have to worry about two devices running out of juice. Unfortunately, this case is made for use with the first gen iPhone and iPod Touch only. Optio E60 one of the cheapest digital cameras?